Info Anatole France, pseudonym for Jacques Anatole Thibault (1844-1924), was the son of a Paris book dealer. He received a thorough classical education at the Collège Stanislas, a boys' school in Paris, and for a while he studied at the École des Chartes. For about twenty years he held diverse positions, but he always had enough time for his own writings, especially during his period as assistant librarian at the Senate from 1876 to 1890. His literary output is vast, and though he is chiefly known as a novelist and storyteller, there is hardly a literary genre that he did not touch upon at one time or another. France is a writer in the mainstream of French classicism. His style, modelled on Voltaire and Fénélon, as well as his urbane scepticism and enlightened hedonism, continue the tradition of the French eighteenth century. This outlook on life, which appears in all his works, is explicitly expressed in collection of aphorisms, Le Jardin d'Épicure (1895) [The Garden of Epicurus]. France had written several stories and novels before he achieved his first great success with Le Crime de Sylvestre Bonnard (1881). The novel received a prize from the Académie Française, of which France became a member in 1896. In 1885 he published Le Livre de mon ami [My Friend's Book], a kind of autobiographical novel, which he continued with Pierre Nozière (1899), Le Petit Pierre (1918), and La Vie au fleur (1922) [The Bloom of Life]. From 1888 to 1892 France was the literary critic of the newspaper Le Temps. His reviews, inspired by the scepticism of Renan, but highly subjective, were collected in four volumes under the title La Vie littéraire (1888-92) [On Life and Letters]. About this time France turned sharply against the naturalism of Zola. His own work of this period consists of historical fiction that evokes past civilizations with great charm and deep insight. The period of transition from paganism to Christianity was one of his favourites. In 1889 appeared Balthazar, a fanciful version of the story of one of the Magi, and in 1890 Thaïs, the story of the conversion of an Alexandrian courtesan during the Christian era. L'Étui de nacre (1892) [Mother of Pearl] is the story of a hermit and a faun, an ironic conjunction typical of France's art. In 1893 France published his most celebrated novel, La Rôtisserie de la Reine Pédauque [At the Sign of the Reine Pédauque], a vast tableau of life in eighteenth century France. The central figure of the novel, the Abbé Coignard, a complex, ironical, and lovable character, reappears in Les Opinions de Jérôme Coignard (1893) and the collection of stories Le Puits de Sainte Claire (1895) [The Well of Saint Claire]. With the tragic love story, Le Lys rouge (1894) [The Red Lily], France returned to a contemporary subject and in the following years wrote Histoire contemporaine (1896-1901), a group of prose works, not really novels, that have their unity in the character of Professor Bergeret, one of France's most famous creations. In his later years France became increasingly interested in social questions. He protested the verdict in the Dreyfus case and developed some sympathies for socialism. Among his last important works were a biography of Joan of Arc (1908), Les Dieux ont soif (1912) [The Gods are Athirst], and La Révolte des anges (1914) [The Revolt of the Angels]. The collected works of Anatole France were published in twenty-five volumes between 1925 and 1935. This autobiography/biography was first published in the book series Les Prix Nobel. It was later edited and republished in Nobel Lectures. To cite this document, always state the source as shown above. 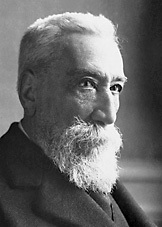 Anatole France died on October 12, 1924.